Highway Entertainment CEO, Steve Josifovski will be providing a 1 hour seminar at Pinfest Newcastle. Taking place this Saturday, September 22 from 12.30-1.30pm, Steve will be talking about what makes a successful arcade game, the history of the industry and what he has learnt in his 25 years in the arcade business. 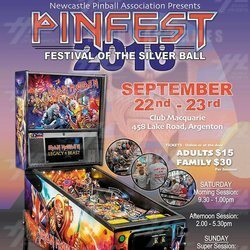 Originally launched in 2012, Pinfest Newcastle will be held at a new event this year. Club Macquarie will allow the space for over 70 pinball machines, all set to free play. Entry to each session, with two taking place on Saturday (9.30am-1pm and 2-5.30pm) and one on Sunday (10-3pm) will be $15 per adult. Tickets to the seminar cost $5. All proceeds from the event are donated to local charities with over $50,000 raised from past events. This years charities set to receive funding are the Westpac Rescue Helicopter, Hunter and Northern Kidney Association and Wesley Mission Newcastle. There are still remaining tickets to the seminar, which can be purchased here.